Table Top Static Gas Sensing Unit (Model: TPD-BARC-16CH): The unit is suitable for monitoring or recording the response of 16 sensing elements simultaneously under controlled conditions of operating temperature and gas environment. The instrument when coupled to a personal computer or Laptop that directly displays the resistance of all the elements as a function of time. 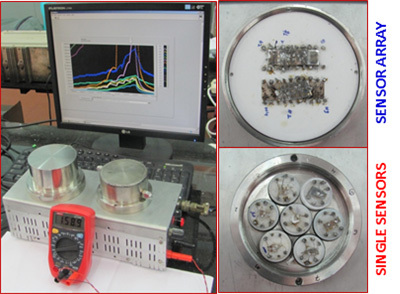 The unit can measure the resistance variation from 1 GΩ to 1 KΩ. Gas sensing is one of the widely investigated activities in the research field. With the advent of nanoscience and nanotechnology novel materials with superior performances are being routinely synthesized. 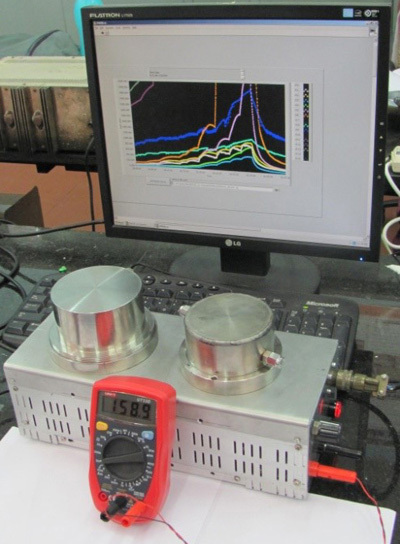 Development of gas sensors based on these materials demands a thorough investigation of these materials under controlled conditions of operating temperature and gas environment. Further, to speed up the time for process optimization, simultaneous measurement of multiple sensors under identical conditions is desired. For this purpose, BARC has developed a Table Top Static Gas Sensing Unit (Model: TPD-BARC-16CH), which can monitor the response of 16 sensing element simultaneously. Possible to tune the operating temperatures in the range from RT to 300°C. Table Top Static Gas Sensing Unit (Model: TPD-BARC-16CH) is suitable for monitoring or recording the response of 16 sensing elements simultaneously under controlled conditions of operating temperature and gas environment. The unit comprises of two main parts namely the test chambers and the data acquisition system. The unit is provided with two test chambers. One is devoted to sensor array wherein two sensor arrays comprising of 5 sensing element each with two heaters and two readers are provided. The other sensor chamber contains 7 individual sensing elements. Each sensing element is provided with a heater (two Pt-100’s in parallel) and a PT-100 based reader. All the heaters are connected to an array of temperature control circuits provided with a Pot (variable resistance) that can be used to tune or set the operating temperature (RT-300°C). All the readers are routed to the digital multimeter via 8-pin band change switch and eventually to multimeter through banana connectors. The stainless steel test chambers are provided with two values (inlet or outlet). The test volume of the chambers is 250 cc. By injecting the known amount of test gas in the chamber through an inlet value provided with septum the concentration of the test gas can be controlled. For recovery measurements, the sensor chamber cap or top needs to be opened subjecting the sensors to the ambient environment. All the leads of the sensing elements (32 in total) are connected to the data acquisition card located in the housing just below the test chambers. The data acquisition can record the resistance as a function of time simultaneously for 16 sensing elements. The unit can record 6 orders of resistance change in the sensing element. The resistance range can be suitably set to either MΩ to Ω or GΩ to kΩ. A room of 3×3 m2 floor area is needed to accommodate above mentioned facilities. 1 person with diploma in Electrical/Electronics.